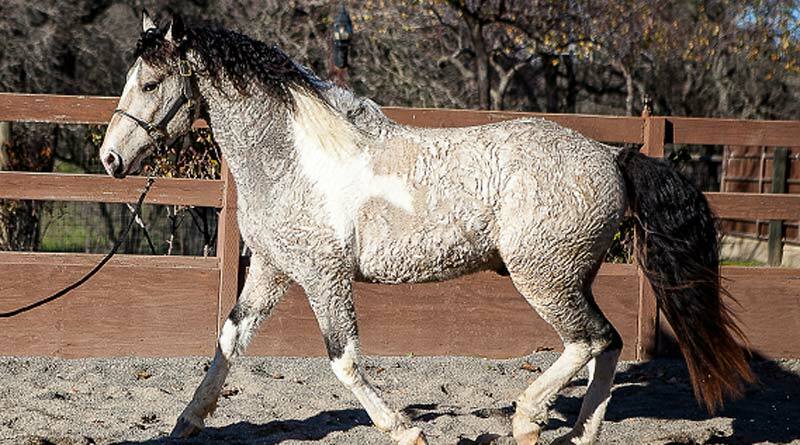 What is the genetic origin of the curly coats seen in some horses? Researchers in France have carried out a genetic study in a bid to answer the question. Curly horses can display various degrees of curliness in their coat, mane, tail and ear hairs. It can range from minimal scattered curled hair up to an extremely dense “micro curled” permanent coat as observed in certain Missouri Fox Trotter lines. Their origin is still a matter of debate and several genetic theories have been proposed to explain this, according to Laurent Schibler and his colleagues, writing in the journal Genetic Selection Evolution. The study team set out to map the location of the dominant curly hair gene and to identify the genetic variant that causes it. They found that a minor mutation in the keratin 25 gene is associated with the dominant curly hair coat trait in horses. DNA from 51 curly and 19 straight-haired French and North American horses from 13 paternal families were investigated in the study. A single strong signal was observed on equine chromosome 11, in a region that encompasses the type I keratin gene cluster. They zeroed in on a segment including 36 genes, which included 10 keratin genes (these are genes that provide instructions for making proteins called keratins, which are key elements in hair and skin). To comprehensively identify candidate variants within these genes, further genetic research was undertaken, with one variant in the KRT25 gene standing out. This was confirmed by testing a larger population of 353 horses, pinpointing the KRT25:p.R89H variant as responsible for the dominant curly trait. However, five curly horses were observed which carried neither the variant nor the main haplotype associated with curliness. “Sequencing of KRT25 for two discordant horses did not identify any other deleterious variant,” the researchers reported. “A second dominant locus [location] may also be involved in the shape of hairs within North American Curly horses,” they said. The study team comprised Schibler, Caroline Morgenthaler, Mathieu Diribarne, Aurélien Capitan, Rachel Legendre, Romain Saintilan and Maïlys Gilles, all with the University of Paris-Saclay; Diane Esquerré, with the Cell Genetics Laboratory within the science agency INRA; and Rytis Juras, Anas Khanshour and Gus Cothran, from Texas A&M University.